Last edited by patzer on Thu Mar 28, 2013 11:37 pm UTC, edited 1 time in total. Is /s?he|it/ modifying the tower or destroying it? 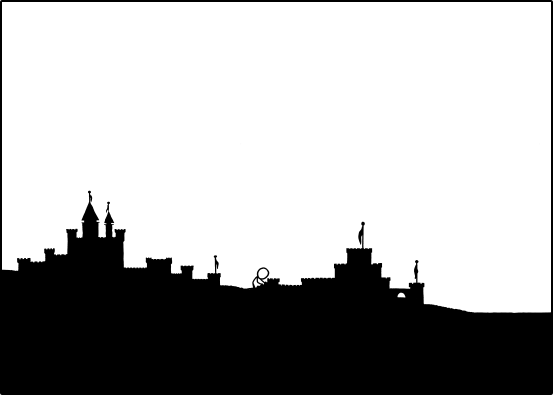 He appears to be connecting the two castles. Perhaps building a new tower between them? Last edited by mscha on Wed Nov 06, 2013 10:18 pm UTC, edited 1 time in total. mscha wrote: He's taking the flag. :( No other changes, sea level constant. So you're saying Monroe has drawn this comic that has taken four days and counting to experience, has people building sandcastles and talking about swimming while at what appears to be a beach, only for it all to not be a beach, but with no clues to that effect at all? Why? You are pretty clearly wrong. He didn't walk ON the water, he walked IN it. When the legs and the water are the same color, it can be difficult to tell the difference. If you haven't read all 4000+ posts you should do so. Right now. He tripped and broke some of the turret while he was stealing the flag. Man, Cueball is clumsy! KroniK907 wrote: I HAVE A PREDICTION!! But they're the simplest things we know of that can reliably simulate people! For the "he doesn't exist" hypothesis to compete with the "well, Zaphod's just this guy, y'know?" hypothesis, it has to explain the observed phenomena at least about as well - which would mean postulating a mechanism capable of causing posts to appear that appear to have been written by people, but which aren't written by people. Doing that in a way that's simpler than just assuming there are people somewhere beyond the screen is tricky. Is it normal to feel terrible because I'm going to sleep? Someone should write an article in the wiki regarding the TRSDS ("Time" Related Sleep Deprivation Syndrome), in the mean time I will try to fight the urge to stay awake. See you in 20 TF. Last edited by udscbt on Thu Mar 28, 2013 11:43 pm UTC, edited 1 time in total. I am starting to feel like the breakfast club? Will we all still care about each other after the end of Time? I think you'll find it went full circle very early, after approximately 6.283 frame. On the "Can you swim in Oobleck" question, it's a non-newtonian shear thickening material, so it has pretty similar rheological properties to quicksand. Try to punch either, and your hand will bounce off, but you can pour both like water. You can certainly swim in quicksand. It's more dense, so you float better, but you have to make sure you keep your arms below your head, or your head will sink below the level of the quicksand. You've also got to be careful of not tipping over, as your legs have a tendency to float up and then it's harder to keep your head up. You can swim, you just have to move slowly, and not panic. Handy advice for anyone caught in a sea of Oobleck. What exactly did Megan get in her mouth in 175??? What's so special about 360? If you want it to go full circle it should take tau frames. @Aubron - I'm on an iPad-1, I have no arrow keys to step through the pix, help? 336 is twice 168, the number of hours in an Outsider's "week". rpgamer wrote: So, is this actually a comic, or a social experiment? Why are they presumed to be mutually exclusive? Well...we had to have some discussion on a dialogue frame. They're rare enough.